There were probably better ways to have conveyed this message to a child. But my father grew up in mid-century Newark, N.J., the son of an Irish barkeep. He hailed from deep in the heart of Philip Roth territory and they didn’t mince words back then. Whenever I asked my mother if I was an “accident” — as I did from time to time — she’d fob the question off awkwardly. “You were a planned accident” she’d say with a chuckle, trying to reassure me. But her laughter belied the truth. I remember once asking my mother when I was still fairly young what was the most important invention that had happened in her lifetime. I was expecting to hear something like penicillin or the atom bomb. Instead, the answer she gave surprised me. 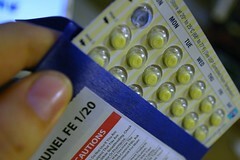 She said that it was the invention of the birth control pill. Because of my move and the unprecedented nature of the British elections, I will not be posting my Friday Pix this week. But I’m over on Twitter all week long posting my faves. Come visit @realdelia. See you next week! Image: Here’s To A Shrunken Cyst by Phoney Nickel via Flickr under a Creative Commons License. Great post, Delia. Accidents do happen, and sometimes they’re a joy, like you. You were certainly the best accident ever happened to me! Minor correction: it was 5 pregnancies (including 1 miscarriage) in 6 years, which certainly changed my mind about papal infallibility. As to why those pills ended up in the basement frig, I can’t remember — maybe because there was a lot of talk in the sixties about possible ill effects of the pill & I decided to switch contraceptives? I certainly did that. In any case, a most happy Mother’s Day to you too! Happy move and election analysis. I have been thinking lots about the BC pill, because it made such a remarkable difference to my friends and their lives. I could not take them ever….so I envied their privilege and freedom – when very young I thought that was why I did not have any boyfriends. I was an accident conceived on the move from Doctorate at Columbia University to Seattle and first job. Too close in age to my sister who was abusive all my life and my mother too tired to cope with a “sickly” child in a new location. I think if the BC had been here, I would not have been born. Makes one think and consider. Makes my 2 birth daughters and 1 adopted daughter very special indeed. Thank you for sharing this post…it meant a great deal to me.